As the Syrian revolt continues to tear the country apart, the international community has been eager to condemn Syrian President Bashar al-Assad, even as it became clear that the rebels do not, in fact, represent a popular uprising against the oppression of the Assad regime. 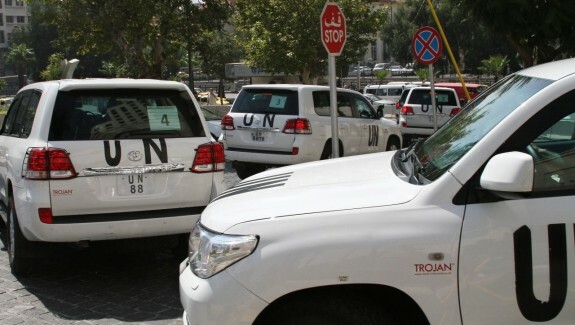 According to UN diplomat Carla del Ponte, however, it appears that the recent chemical weapons attack, in April, was carried out by the Syrian rebels and not the regime, as it had been widely assumed. Speaking to a Swiss television channel, del Ponte said that there were “strong, concrete suspicions but not yet incontrovertible proof,” that rebels had carried out the attack. She also said UN investigators had seen no evidence of the Syrian army using chemical weapons, but that further investigation was needed. A spokesman for the rebels denied responsibility for the most recent attack, which allegedly involved the deployment of sarin nerve gas. He pointed out that the Free Syrian Army does not possess the missiles or shells necessary to deliver the chemical agent. Sarin gas, however, can be delivered in a number of ways. Additionally, while the rebels claim that the chemical agent was delivered by missiles or artilery, there is no evidence of a missile strike or shelling in any of the many videos that have been uploaded to the internet in the wake of the alleged attack. After swift initial progress in the more than two-year-old conflict, the rebel advance was stalled as Lebanese terror group Hezbollah sent fighters to the regime’s aid. Whilst a number of towns have been taken and then retaken by each side, Assad’s forces have gradually gained the upper hand. With his army making gains and the eyes of the world upon him, it seems unlikely that the Syrian President would risk carrying out a chemical attack – particularly against an urban area. The Syrian government has flatly denied responsibility for this latest alleged chemical weapons attack and although not widely reported in the western media, there is broad suspicion that it was, indeed, carried out by the rebels. Ultimately, it may prove impossible for UN inspectors to determine who was responsible for the incident. Further, their investigation may be curtailed by the seemingly imminent military action – possibly in the form of cruise missile strikes – by the United States and the United Kingdom. US President Obama has sent out mixed messages, regarding his intentions towards Syria; whilst he has stated that the US would not take military action against Syria without a UN mandate, it appears that preparations for an attack are already well underway, with American and British naval forces massing in the region. There is widespread speculation that strikes could be carried out within a week, despite strong and repeated warnings from both Russia and Iran, as well as the Syrian regime itself. One of the most ominous repercussions of US intervention against the Syrian government is the possibility that Iran and it’s surrogate in Lebanon, Hezbollah, will launch strikes against Israel, in retaliation. This, in turn, could lead to a regional war, with Russia and the US lined up on opposing sides. The United States government has been quick to condemn the Syrian government for the latest chemical weapons attack. Now that much of the evidence suggests it may have been carried out by the al-Qaeda-affiliated rebels, President Obama should remember that he, along with his supporters and political allies, devoted much time to condemning his predecessor for leading the US into war based on questionable intelligence. UPDATE: This article was updated to clarify one or two points that some of our readers found misleading: The chemical attack earlier this year was widely blamed on the Syrian regime. It is this attack that the UN now concludes was carried out by Syrian rebels. It appears unlikely – for a number of reasons – that the most recent August 21st attack was carried out by government forces – despite the rush to judgement within the international community – although this has yet to be fully determined. It is clear that both sides in the Syrian conflict have the means to use chemical weapons and it would be misguided to assume that either side has a moral objection to such attacks. 19 Responses to "Syrian Chemical Weapons Attack Carried Out by Rebels, Says UN (UPDATE)"
Thank you very much for the article plus update Graham. The US (+UK+France) rush towards military action pongs to high heaven. It has “Iraq3” (2 being Libya) written all over it. Hopefully the UN will produce a credible report in due course. Until then maybe the Russian presence may help sanity prevail. This article is indeed shaky at best. The author is claiming suspicions as facts on one side and on the other hand claiming that because there no picture of a missiles in an internet video then it is doubtful. the pictures of womens and kids who cannot breath is a good proof. second the author claims that the regime was making progress so he did not need to use weapons. very misleadind because it is not true on the contrary it was the rebels who were making progress in the 3 weeks period before the attack. the progress the regime made was more than 7 or 8 weeks ago and after that he started losing again. so that claim was intended to mix up the times to create doubts. third there was a chemical attack (no body denies that), the people who died are the people who were on the rebels side, and the regime was the one who stalled the inspectors to inspect the site this time and every time. if he was innocent eveytime he had perfect opportunity to let the inspectors prove it but he insists that they have no right to say who launched the attack. Come On. first time I see an innocent that wants reject help to prove his innocence. and other who keep killing themselves with chemical weapons. I’ve been saying this all along. The Rebels had everything to gain and Syria had everything that loose. The Rebels probably shot at the UN. Convoy last week. Thankfully I am not the only one with an objective view in this world.